Bare Bones Software, makers of the popular BBEdit, Text Wrangler, and MailSmith, has released Yojimbo, a new tool for information management on the Mac. There is a growing need for information management on a computer system. The growing number of files, folders, and file types fills up hard drives and makes even the most meticulous and obsessive-compulsive filing system difficult to maintain. New methods and tools are required to effectively find small pieces of information amid the growing masses. Spotlight, the much-touted search tool built into OS X 10.4.x, provides some help with this: on-the-fly searches, "smart" folders, and content-indexing of entire volumes are strong starts toward a solution. And while Spotlight has gotten mixed reviews, with some having substantial (and valid) complaints about its effectiveness, Apple is certainly moving in the right direction. But even when it is improved, Spotlight won't meet the needs of every situation. Users are finding many creative ways to deal with handling information, from something as simple as a huge, always-open text file to things as complex and elaborate homemade databases. Additional tools to manage an information workflow have become useful, if not necessary, additions to many die-hard users' software toolboxes. Some of these applications are basic notepad or note-taking systems, while others are outliners or freeform databases. Each offers some degree of text-editing capability so that clipboard contents can be easily dumped into a container for later retrieval. Many of them allow storage of more than just text, including media files, documents of a specific format (.doc, PDF, or RTF, for example), and website bookmarks and/or archives. And some offer specialized ways of storing data, such as serial numbers, passwords, and other private information. Depending on which application you choose, you may encounter a fairly steep learning curve before you can tap into the program's usefulness. Typically, there is a correlative degree of difficulty based on the inherent power and capability of the program. Sometimes usability means a sacrifice in the robustness of the program. Enter Yojimbo. Bare Bones set out to create an information management application that was usable and friendly to get oriented with - in fact, their website boasts, "There is no learning curve." Yet they also wanted a product that would have enough power to be useful. An obvious but elusive goal: both useful and accessible. For the most part, they have succeeded in reaching that goal. The resulting application, Yojimbo, is designed to be the keeper and dispenser of your information. Yojimbo, which apparently comes from a Japanese word meaning "bodyguard" or "security person", could be seen as the protector of your digital information. The user interface is a simple, single-window design, not unlike iPhoto or iTunes. In fact, these apps appear to represent the metaphor Yojimbo is going for: If you like the way iTunes and iPhoto allow you to organize your music and photos, you will probably like the way Yojimbo allows you to organize other parts of your digital "life" - serial numbers, passwords, email clippings, and other snippets of information. It's very easy to get new information into Yojimbo. Besides using the File menu's "Import..." command and dragging a file (or group of files) onto Yojimbo's icon, Bare Bones has provided a handful of other ways to get data into the database. You can drag-and-drop URLs and clips from websites as you're surfing. You can use Yojimbo's Services menu, which offers to copy either a text selection or a URL. You can use Yojimbo's "print-to-PDF" feature that, partnering with Apple's PDF printing capability, allows the creation of a new PDF already imported into Yojimbo. There are editable hotkey combinations that allow for easy information depositing (though one of the default choices overlaps with a system keystroke). Or, in perhaps the freshest and most useful addition, drag a document, URL (from the browser's address window), or other file or clipping to the "Drop Dock", and a tab that can be placed on either side of the screen and automatically reveals your Yojimbo depositing options. Once your information is imported, using it is very straightforward. Yojimbo organizes your data into "Collections". There are user-defined Collections, created with the familiar Plus button at the bottom of a sidebar; you can drag files into these, a la iTunes, and they will be added while also remaining available in the main "Library". User-defined collections also become available in the Drop Dock. 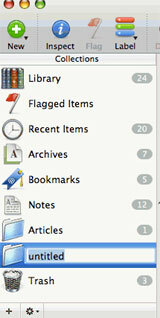 Yojimbo also includes a set of Smart Collections - Bookmarks, Archives, Recent Items, etc. - that are automatically updated based on the file's Kind category. Oddly, Yojimbo does not include the option to create custom Smart Collections, so users are stuck with the predefined list. Still, this sort of organizational system is strong in function and should be familiar to most Mac users. Another familiar aspect of the interface is the Inspector. This window allows users to edit one type of metadata - Comments - and have quick reference to other metadata such as the file's kind, when it was added to the Library, and what Collections it belongs to. Yojimbo is also Spotlight-searchable; Spotlight can search within the contents of the Yojimbo database, and the application utilizes the Spotlight engine to perform internal searches. One nice addition here is that, within a search, clicking on the various Collections will narrow the results accordingly. Some may say that metadata in Yojimbo is somewhat thin. (Others might find it refreshingly lean!) You can add comments to any file or document, and these are searchable in addition to the document's title and body. And Yojimbo uses a set of Labels, such as "Personal", "To-Do", or "News" - again predefined, although these are user-editable - that applies both a color and a category to any file. Files can be flagged, and the addition to any Collection also becomes a part of the metadata set. Yojimbo offers a basic text editor, which appears to be the Apple TextEdit shell. You can also choose to edit text through TextEdit directly by selecting "View in TextEdit" in the Items menu. It's curious that Bare Bones elected not to use Text Wrangler as the accompanying text editor, and that they did not offer BBEdit as an alternative external editor. New documents are created as .txt files, and while Yojimbo can read RTF-formatted documents, it cannot create them (though it is easy enough to convert a file to RTF, if necessary, by viewing it with TextEdit). This application may find its most popular use as a companion to the avid Web surfer. As I've already mentioned, it's easy to get information from the Web into Yojimbo. You can choose to handle URLs as bookmarks or as Web archives, though this choice must be made through the Preferences pane each time you want to switch (unless you start from the File menu to create a new bookmark or Web archive). Bare Bones includes the interesting bookmark option to "Move to trash after opening", which affords a surfer an easy way to tag a URL for a return visit without committing it to a permanent set of bookmarks. One of the biggest features for Yojimbo is that it is .mac sync compatible. In other words, you can use your .mac account to sync your Yojimbo information between two Macs. This is great for users who must work on more than one machine regularly, or for users who need to access personal information at work but needs it to remain secure. It might also be helpful for a family to put to use if they share a lot of information, like Marcie and I sometimes do. Probably the most appealing feature for me is the secure storage of select information, such as serial numbers and passwords. Any document in Yojimbo can be encrypted, and the security for the application uses the AES-256 algorithm standard. Yojimbo has preformatted templates for this kind of information, so it's suddenly easy to keep all of this information in one place. This means that all of the user names and passwords that my family and I use - whether frequently or infrequently - can be warehoused in a safe place that is also readily accessible. I'm sure there are other applications that do this job well, but I like the flexibility of having an information manager do it without requiring a single-purpose application that I'll forget to maintain. 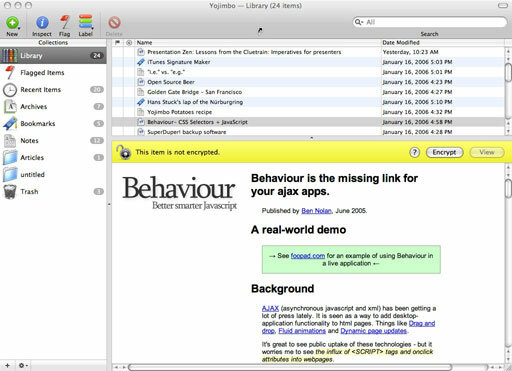 Yojimbo is a Cocoa-developed application. This brings a few benefits that are not immediately apparent: It will necessarily be lean and functional without requiring an enormous amount of RAM (about the same as Address Book) or hard drive space (just under 6 MB, compared to AppleWorks' 16 MB). And it is universal binary right out of the box - great if you plan to upgrade your Mac to a new Intel-based model soon. Notably missing is AppleScript support. Bare Bones' other products are thoroughly scripted, so it's curious that they haven't offered any scripting for Yojimbo. Also notable is the requirement for a very recent operating system; users of OS X versions prior to 10.4.3 will be frustrated that Yojimbo does not work for them. Licensing fees are reasonably low, and most users in the market for this sort of product will find their prices competitive. A trial version is available online. As a deeply committed DEVONthink user, Yojimbo offers me a redundant feature-set that doesn't provide nearly enough power for my day-to-day usage. However, it's perfect for Marcie, who has a use for something more than just a big text file but considerably less than DEVONthink. Our license, therefore, will live on her Mac mini. Overall, I found Yojimbo to be a good addition to the admittedly crowded market for information management. It offers a good balance of powerful capabilities and simple user-friendliness that will fit the needs of many. Though there are some missing or limited features that make the program feel incomplete, it is a very good effort for version 1.0. I recommend Yojimbo for those who need something to keep their information in, but don't need the heavy-duty research ability and artificial intelligence features of a program like DEVONthink. Since this is the first software package I've reviewed, I'll introduce a new rating system for Efficient Mac User software reviews. I'll rank software on a scale of one to six "cals", indicating how much I estimate a given application will improve efficiency and effectiveness in computing. Obviously, six cals is the best, while only one or two cals is not a very high recommendation. For Yojimbo, I give it 4.5 cals. Except for the handful of missing/limited features (which I'm inclined to write off as a typical v.1.0 issue), it would have earned 5 cals; those elements, however, were enough to knock off a half.